With modern life being more hectic and stressful than ever before, it's never been so important for people to be able to get away from it all and relax in lovely locations around the world. Travel shouldn't just be regarded as a luxury: it's essential for people's mental and physical well-being to spend some time outside of the city and embrace some new surroundings, and there's no better place to go if you're looking to chill out and have some fun than the beach. Central America has seen a surge in popularity in recent years as more and more people grow to learn about the beauty and benefits of countries like Nicaragua. This Central American nation has a relatively long coastline on its eastern side, with huge swathes of sand sitting right along the edge of the Caribbean Sea, as well as many more beaches over on the west, facing out to the Pacific Ocean. This means that you can enjoy the warm waters and tropical sunshine of the Caribbean without actually paying the extra costs that often come with a trip to a typical Caribbean island. Not only that, but Nicaragua also has a long list of Pacific Coast beaches for visitors to enjoy as well, along with unique cuisine, lively nightlife, unique architecture, and more. In short, it’s a terrific place to visit for a whole lot of reasons and has some of the prettiest beaches in Central America. One of the best things about visiting beaches in Nicaragua is that this country is a growing touristic destination but still remains relatively unknown to the masses. This means that even on the warmest, sunniest days of the year, you can find huge stretches of Nicaraguan sand all for yourself, able to listen to the sound of the waves and feel totally at peace, rather than being crowded out by the noise and movement of hundreds of other beach-goers. If you’re looking for the best beaches in Nicaragua, read on to learn all about them. Definitely one of the better-known beaches in Nicaragua and a big hit with tourists and locals alike, San Juan Del Sur is found over on the Pacific Coast of the country and provides a lively atmosphere and superb surfing conditions. The waves here can reach some very impressive heights that will definitely appeal to surfers, but simpler activities like swimming, sunbathing, and beach games can all be enjoyed on this Nicaraguan beach as well. The beach also hosts various festivities and special events at certain times of year and can be a super spot to soak up some of the local culture. Also, on the Pacific Coast of Nicaragua, Playa Majagual will definitely have a strong appeal to people who prefer their beaches to be as pristine and natural as possible. Some of Nicaragua's beaches are built-up due to tourism, with lots of restaurants, bars, hotels, and more right by the beachfront, but this one has been left largely untouched for now, retaining its natural beauty and tranquil atmosphere. It's only a short drive away from San Juan Del Sur but offers a much calmer experience overall. 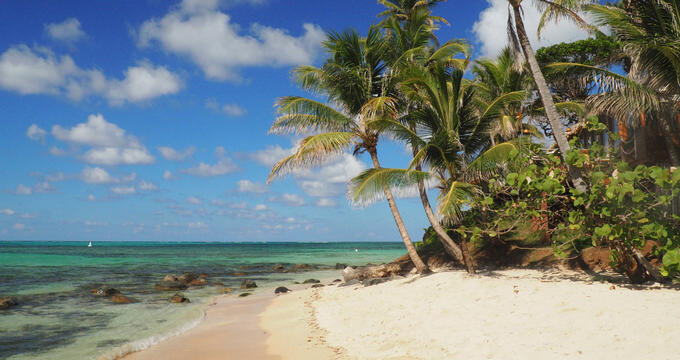 If you've got the time, be sure to add the Corn Islands to your Nicaragua vacation itinerary. These two little islands are found a few dozen miles off the Nicaraguan mainland coast on the Caribbean Sea side of the country. Effectively, they offer the same sort of experience you'd expect to enjoy at a Caribbean destination like the Dominican Republic, including soft white sands, lush palm trees, super scuba diving opportunities, and tasty local food. These islands never seem to sleep either, with lots of fun nightlife activities being organized over on Little Corn Island in particular. Located on the Pacific Coast of the country, Playa Marsella is easily one of the most beautiful beaches in all of Central America. The sands stretch out a long way here, offering plenty of room for everyone to enjoy, and lush vegetation lines the edge of the beach, making it feel just like a private island in the middle of the ocean. The only signs of civilization are the few hotels and villas dotted around the surrounding landscape. One of the best things to do at Playa Marsella is visit in the late afternoon to watch the sunset, and this can be a very romantic spot for couples or newly-weds on their honeymoon. Also known under its English name of Pearl Lagoon, this Nicaraguan beach is found on the Caribbean side of the country. With shimmering soft sands and turquoise waters, it's a real haven for holiday-makers and the ultimate place to go if you just want to relax and feel completely cut off from the rest of the world. Beautiful scenery surrounds you in every single direction at Pearl Lagoon and this is a prime spot for people to take some gorgeous photos and make memories that will last a lifetime.